EZ-DigiSign supports many computer monitors and flat screen high definition televisions. Most flat screen televisions will need a stand or a mount. The following retailers are our recommended suppliers of television mounts for your EZ-DigiSign. Which is better a plasma or LCD display? This is a common debate and we have identified a few articles to help you decide for yourself. How do plasma and LCD screens work? This is a complex question. Again, we have identified two webpages that will help you learn as much as you want to about the plasma and LCD technologies. 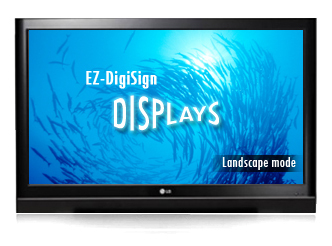 There are many models of flat screen TVs and computer monitors work as a display with EZ-DigiSign. When purchasing a display, there are five key considerations. They are, size, resolution, connection, mounting/security, and mode of display. While EZ-DigiSign does not sell displays, the information on this page will serve as a guide to help in the purchase of a compatible display with the desired quality. 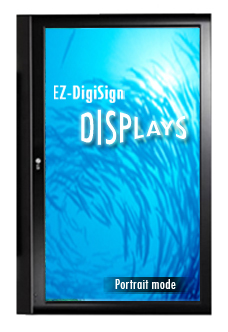 Virtually any size screen or monitor will work with EZ-DigiSign. In some situations a 24" flat screen computer monitor will work best, like in a doctors office. In other situations like a corporate break room, a 40" LCD or plasma TV screen will be more applicable. In most cases, the location where the digital sign will be placed will best determine the size of display. The resolution of the display is important as is determines the quality of the picture. Higher resolutions produce a more crisp and clear picture with vibrant colors. High definition televisions support many resolutions. Click here to view EZ-DigiSign's recommended resolutions. The main compatibility requirement for the display is the connector. The EZ-DigiSign player connects only to displays that have a VGA connector (as shown below). VGA connectors are standard with computer monitors but are not as common with television screens. When purchasing a television for the digital signage display, make sure it has a VGA connector on the unit. Displays can be mounted in several ways. Computer monitors typically sit on a desk or counter. Television monitors, however, are different. Flat screen televisions do not typically include stands or mounts. Commercial quality televisions have a VESA standard mounting set-up that will work with most mounting configurations. Mounting options include wall and ceiling mounts. When a wall or ceiling is not available for mounting, counter or floor stands are used. Each mounting option will have variations to choose from. Visit our suggested suppliers (listed on the left of this page) or your local retailer for more information. The mode of display is a choice between portrait and landscape signage. While standard computer monitor and television orientation is landscape, there are times when portrait signage is preferred. In these situations, the display must support that mode of signage. Likewise, if tiling a group of displays to portray one image, all of the displays must be compatible. View the different display models on this page.